STS-127 Spacewalkers Dave Wolf and Tom Marshburn have completed EVA-2, following robotic work to handover the Integrated Cargo Carrier-Vertical Light Deploy (ICC-VLD) to the Space Station Remote Manipulator System (SSRMS). Meanwhile, Endeavour has been cleared for re-entry following the DAT (Damage Assessment Team) evaluations on the orbiter’s TPS (Thermal Protection System), while Discovery’s ET-132 intertank foam is tested. No major issues are being worked with Endeavour, as she patiently remains attached to the International Space Station (ISS) during the docked phase of the mission. 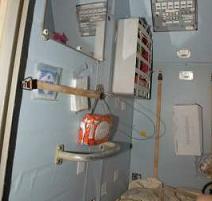 However, the Station had suffered from a problem with the Waste and Hygiene Compartment (WHC) in the Destiny module. 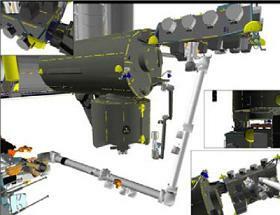 The toilet – which arrived with Endeavour on STS-126 – was out of action until the first half of Flight Day 6. The six station crew members are using the facilities in the Russian Zvezda module, while Endeavour’s crew use the shuttle facilities – the Waste Collection System (WCS) – until the toilet is back on line later today. “ISS Waste & Hygiene Compartment (WHC) Anomaly: At GMT 200/14:14 the crew reported an error indication on the WHC control panel following an inadvertent dose pump activation. Control panel should have safed system after 8 sec and did not,” noted a Mission Management Team (MMT) overview of the problem (L2). “MCC had the crew manually shut the pump off by turning the main switch on the control panel to Off then the rack power switch to Off. “Team is investigating the dose pump failure to automatically deactivate. Potentially flooding the pump separator unit and COT with pre-treat & water. A similar issue occurred in the SM (ACY) during Exp 14 – required several days to recover (with hardware changeouts). The offload of the Shuttle WCS would be carried out via a water dump. However, due to a contamination threat to the newly arrived JEM experiments – or more specifically potential corrosion issues with the attach points – Endeavour is not allowed to conduct a water dump until after undocking. Thankfully, the facility will be working again by the end of Flight Day 6, as components are replaced during a scheduled three hour work period on Monday. Otherwise the mission is proceeding right along the timeline, with good cryo margins noted on Endeavour, and half of the shuttle to station transfers now complete. 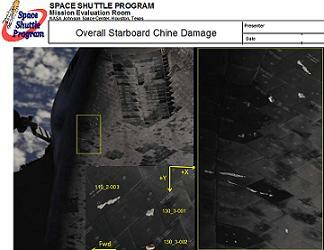 “The MMT cleared the TPS for deorbit, entry, and landing,” was the single line noted on the Mission Evaluation Room (MER) logs, following another fine effort from the DAT engineers – who are tasked with evaluating hundreds, if not thousands, of images from FD2’s OBSS (Orbiter Boom Sensor System) surveys and FD3’s RPM photography. DAT’s findings show Endeavour is a very clean vehicle, bar the 16 areas of damage to her starboard chine – only one of which required further evaluation for clearance due to the depth of the damage. A full article will follow this week, based on the 10 stunning DAT presentations acquired by L2. Further understanding of the liberation events during Endeavour’s ride to orbit will be gained via the cameras on the Solid Rocket Boosters (SRBs), which are now back in port, with footage being sent to engineers on Monday. Although the Chine damage was not caused by the unusual liberation of foam from ET-131’s intertank, the next tank to fly – ET-132 – is undergoing pull tests, to check the adhesive properties of its intertank application. Further tests are scheduled at the Michoud Assembly Facility (MAF) on downstream tanks, if required. STS-128’s launch date is currently under evaluation, based on ET-132’s results, and a realignment of the flow timeline once Discovery has arrived in the Vehicle Assembly Building (VAB) for mating. It is likely Discovery will still launch in the second half of August. “The following operations have been rescheduled to support inspections resulting from the STS-127 launch debris events: Rollover to VAB for integration is scheduled NET (No Earlier Than) July 23. Shuttle Interface Testing will pickup immediately following Orbiter/ET mate. Flight Day 5 was one of the more “relaxed” days in the mission so far – despite the toilet trouble. The main focus of the day was the continued the handover of Endeavour’s elaborate payloads to the ISS, as managers aim to boost the logistical supplies on Station ahead of shuttle retirement, “currently” set for 2010. The 2J/A package includes the Japanese Experiment Module – Exposed Facility (JEM-EF) and the Japanese Experiment Logistics Module – Exposed Section (ELM-ES) as well as the Integrated Cargo Carrier – Vertical Light Deployable (ICC-VLD). It was the latter ICC-VLD that was pulled out of Endeavour’s Payload Bay on Flight Day 5 by her robotic arm, before being handed over to the SSRMS and stowed on the Payload Orbital Replacement Unit Accommodation (POA). 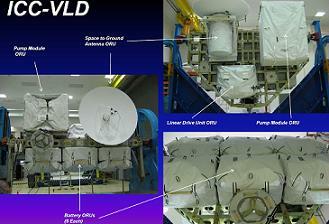 Attached to the ICC-VLD are six P6 truss batteries – which will be part of the P6 battery R&R activities during EVA 3 – a Linear Drive Unit, Pump Module #2, and a Space to Ground Antennae – all of which will be transferred to ESP-3 (External Stowage Platform-3) during the upcoming spacewalks. The Japanese ELM-ES will be installed on to the JEM-EF during Flight Day 7, while the Station’s robotic arm removes the ICC-VLD from POA, before using the Mobile Transporter system to move different worksite. Endeavour is also flying with DRAGONSAT (Dual RF Autonomous GPS On-Orbit Navigator Satellite), MAUI (Maui Analysis of Upper-Atmospheric Injections), ANDE-2 (Atmospheric Neutral Density Experiment-2), SEITE (Shuttle Engine Ion Turbulence Experiment), and SIMPLEX (Shuttle Ionospheric Modification with Pulsed Local Exhaust). Wolf and Marshburn’s EVA-2 conducted the transfer of critical station spare components from ICC-VLD to External Stowage Platform-3, on an EVA that lasted 6 hours and 53 minutes. “SSRMS ICC GRAPPLED: Prior to the start of the EVA, the SSRMS will grapple the ICC, which has been hanging out on the SRMS overnight on FN05,” noted the Flight Plan Walkthrough overview of EVA-2. “ICC ORU (Orbital Replacement Units) Transfers: The EV crew will translate to the ICC and transfer 3 ORUs (SGANT – Space to Ground Antenna, PM – Pump Module, LDU – Linear Drive Unit) from the ICC to ESP3. As hoped, the communication issues did not interfere during EVA-2, following noisy audio issues during the opening spacewalk. The MMT noted that the problem was related to a poor placement of the microphone inside Tim Kopra’s helmet. For live coverage, refer to the live update pages linked above.